This page has been created as part of a project to put planetary control networks on the web. This control network for Jupiter’s moon, Io, originated from Merton Davies and Tim Colvin at the RAND Corporation and was provided to the USGS in 2000. The control network solution was originally performed with software developed at RAND, and documented by Colvin (1992). It has been converted into files that could be used with (successively) the RAND/USGS Planetary Geodesy (RUPG) Software, and the USGS ISIS2 software (using the application, described by Edmundson et al. 2012). Each control network is essentially a set of photogrammetric solution (input and output) files. The input files consist of, aside from a priori information, measurements of common points (control points, sometimes called tie points) on images of a planetary body. The output files include the body coordinates of the control points in latitude, longitude, and radius, and revised orientation information (camera pointing) for the images. The primary use of such information is for the creation of image mosaics of the planetary body. However, these solutions can also provide fundamental data on the size and shape of the body, its rotation period, and the direction of its polar axis in space. The control point coordinates also usually serve as a coordinate reference frame that defines the fundamental coordinate reference system for the body in question. 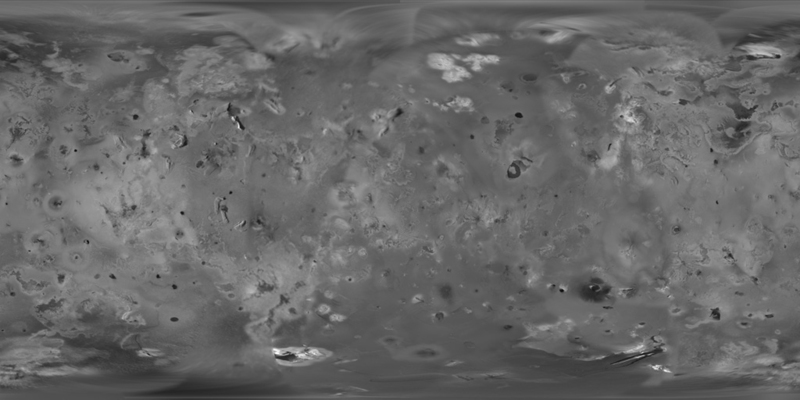 Formatting of this control network data for Jupiter’s moon, Io, has been updated for compatibility with the USGS ISIS2 cartography software. This network consists of 6178 control points and incorporates 253 images from the Voyager I and II missions. The RAND control network available here is the 1995 version of work first described in (Davies et al., 1979); the USGS versions used this RAND network as a starting point. This release is comprised of data from original RAND control network solutions, the USGS ISIS2 qmatch-formatted control network, Voyager I and II images (processed to ISIS2 format), ISIS scripts to process PDS (.imq) images into the ISIS2 format, and file-format description files. Although the subjovian hemisphere of Io was poorly seen by Galileo, superbly detailed Voyager 1 images cover longitudes from 240˚W to 40˚W and the nearby southern latitudes. A global mosaic of the best resolution images from both Galileo and Voyager 1 is shown here that includes 51 Voyager 1 images with spatial resolutions sometimes exceeding the 1 km/pixel scale of the final mosaic. While most of these images neatly overlie the Galileo coverage, the Voyager 1 images of regions west of 0˚ longitude appear displaced from the positions predicted from the control net derived from the solution of the combined Galileo and Voyager data set. We suspect that the discrepancy arises from regional topography west of the sub-Jupiter point, and have adjusted the positions of the Voyager 1 images (all acquired near the limb of Io) to match the best-fit geometry of Archinal et al. (2001). Solar illumination of these longitudes was from the east during the Voyager 1 flyby. Image resolutions range from 1.0 to 10 km/pixel along the equator, with the poorest coverage centered on longitude 50 W.
Created as part of a project to put planetary geodesy control networks on the web. The Io Voyager control network data here was originally provided by Merton Davies and Tim Colvin of the RAND Corporation. Funds were provided for a conversion and archiving effort by the NASA Planetary Geology and Geophysics Program and the NASA Cartography Program. Contained in the ZIP file are the necessary data to open the RAND solution of the Io control network in the ISIS2 qmatch format (.mat) and in its original RAND solution format. Io_control_images.zip – All Voyager I & II images in the Io control network, formatted as ISIS2 (.cub) files. ioxy0.dat – RAND solution image measurements (mm and pixels) input file. ioxy0.mat – RAND solution image measurements (mm and pixels) in ISIS2 qmatch match point format. ISIS-PG-FMT101_XXxy0_dat – Description of format of file ioxy0.dat (in PDF format). ISIS-PG-FMT101_XXxy0_mat – Description of format of file ioxy0.mat (in PDF format). This is a global control network of Io, and incorporates most of the usable images from the Voyager I and II missions. RAND solution files from the 1980’s are provided as *.dat files. The conversion to ISIS2 match point format (.mat) was performed in 2003 without making corrections or adjustments to the network.